Upon complaining about the lack of good barbecue in New England, a friend of mine who works in Taunton, MA told me about a “shack” he saw there that sells barbecue. He saw it a few times, but never had the chance to try it. I did a little research and found out that the “shack” he was talking about was a permanently parked food truck called “Kinfolks” (formerly in Brockton, MA) and it had great reviews. During a spur of the moment lunch outing with my wife, we decided to head over to Taunton to see for ourselves if Kinfolk’s really did have great BBQ. As I mentioned, Kinfolks is a food truck that is permanently parked in a Globe Liquor Store Parking Lot. 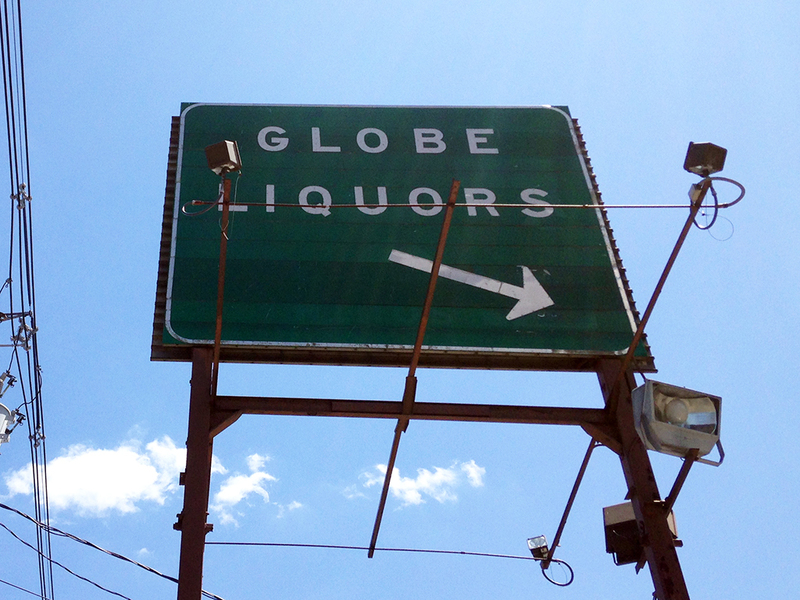 It’s not very easy to spot from the busy road until you’re pretty much right up on it, so keep an eye out for the classic Globe Liquors road sign instead. When you get to Kinfolks you just park and get in line because there are usually a bunch of people waiting on BBQ at any given time. The wait isn’t long, but the policy of Kinfolks is to open at 10:30 AM and then close as soon as they run out of barbecue. There’s nothing fancy about Kinfolks and unless you’re taking your food home, be prepared to eat it on the hood or trunk of your car under the blazing sun. The guys crammed inside the truck are gruff, but nice and willing to make recommendations about how you should eat your BBQ. Out behind the truck are the smokers where the magic is really happening. I came with an appetite so I went ahead and ordered the 2-Meat Dinner for lunch. My wife on the other hand decided that something lighter would do for her, so she ordered a chopped chicken sandwich. 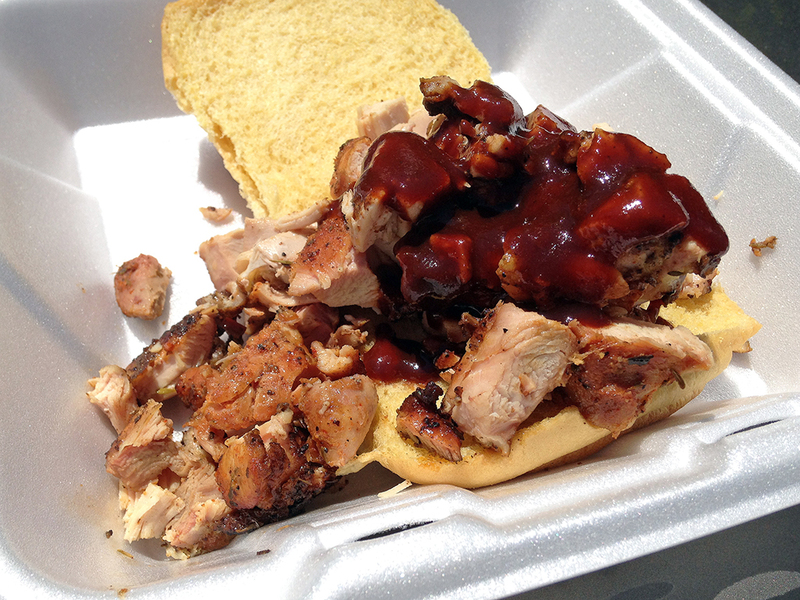 Chopped Chicken Sandwich – I’ll admit that I was more than a little disappointed in my wife for ordering chicken when there were so many other BBQ options on the menu ranging from ribs, to pulled pork, to brisket. Nonetheless, I swallowed my pride along with a delicious bite of her sandwich and immediately offered an apology. The smoked, chopped chicken was incredible! It really took me by surprise how juicy, tender, and flavorful the chicken turned out. Kinfolks knows how to barbecue chicken and I would easily order the chicken again for myself in the future. 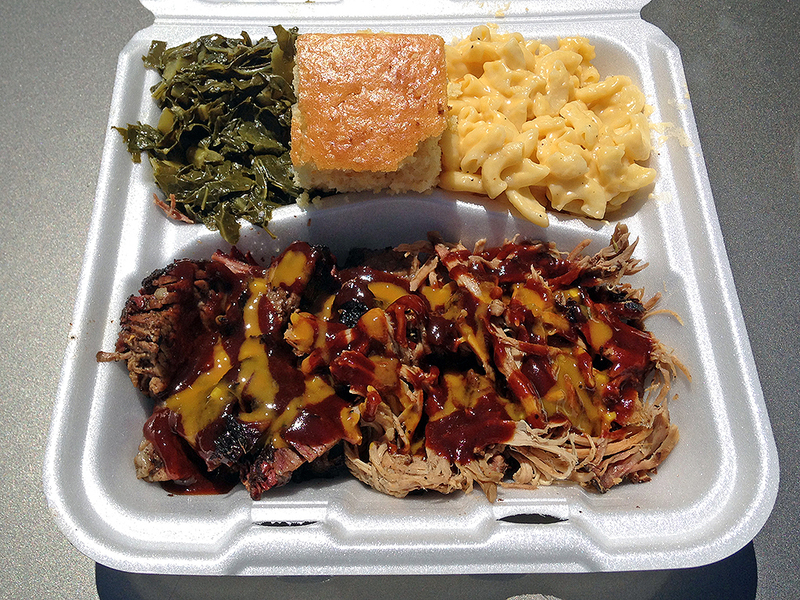 2-Meat Dinner – As for me, I ordered a combo plate with brisket, pulled pork, collard greens, cornbread, and mac and cheese. When our order was ready, the man in the window asked if we wanted any sauce because Kinfolks applies the sauce in the truck themselves. When I asked for a recommendation, the man in the window suggested that I try the sweet classic sauce mixed with the mustard based sauce because “people really like these two mixed together.” The mixed sauces weren’t only visually stunning, but they tasted really good too. The only issue I had was the amount of sauce, which turned out to be a little too much for me. Next time, I might ask for the sauce on the side so I could control the amount in each bite. The brisket was really quite excellent. It was tender, juicy, and not too smoky with a decent amount of crispy fatty bits. The pulled pork was pretty good as well, but relatively standard as far as good pulled pork goes. The collard greens weren’t very good at all and tasted like plain steamed collard greens without any real seasoning. The macaroni and cheese was a little dry and just very very basic. The cornbread also had some decent traditional flavors, but it was a little on the crumbly side for me. The sides in general didn’t really shine, which led me to believe that the real stars of the show at Kinfolks are the meats. 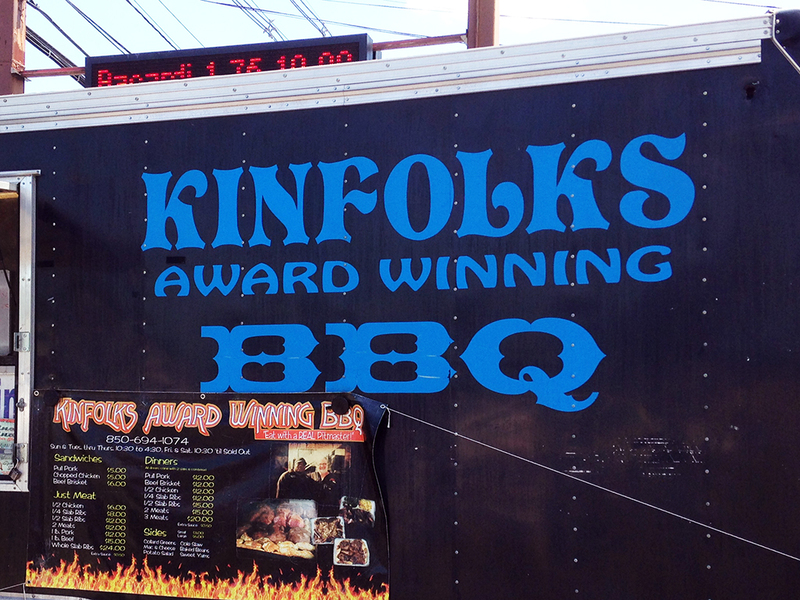 Kinfolks Award Winning BBQ is truly a great find in Massachusetts that surprised me with their BBQ skill. The brisket is really good and the chopped chicken is excellent. Skip the sides (or get them just because they come with the dinner), but try all of the meats because each has its own distinct flavor and preparation. I’m glad I tried Kinfolks so I can add it to the very short list of good BBQ in New England! Good to know! After trying BBQ from every state starting from Texas to North Carolina, the hunt for good BBQ out here has been very lack luster. We’ll have to give this place a go! Thanks for the recommendation. 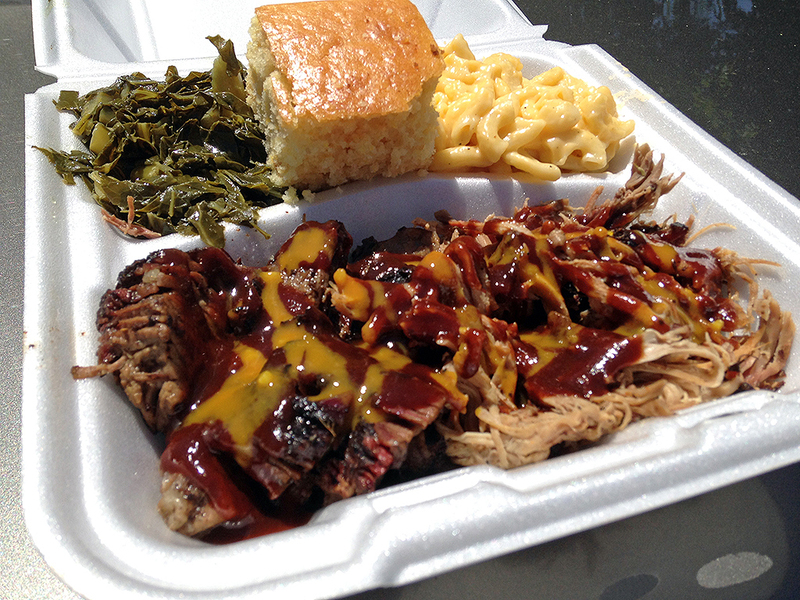 Don’t get the wrong idea from me… The BBQ at kinfolks is good, but it’s a food truck in MA. I’m sure you’ve had better in Texas or North Carolina. 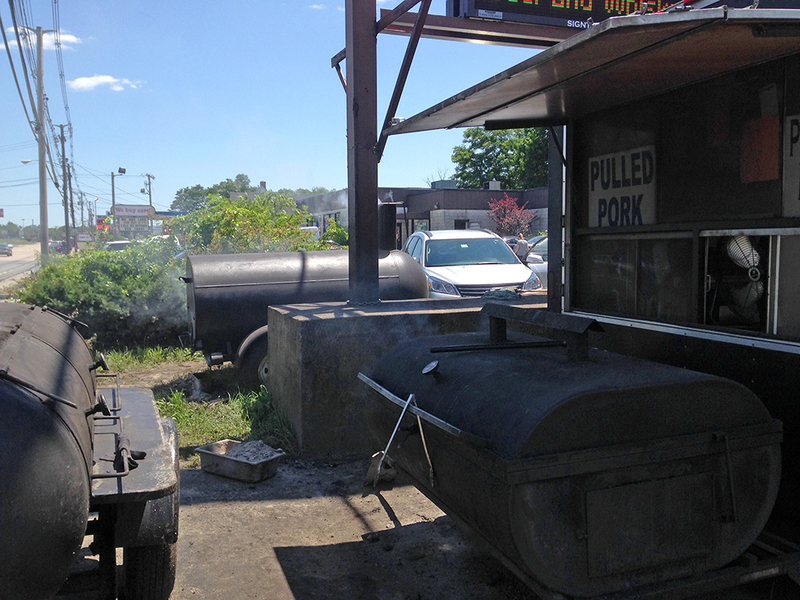 Still… It’s some of the better BBQ we have in MA, so it’s worth a try. Another really excellent place is BT’s Smokehouse in Sturbridge, MA. That place is awesome. Anything is better than the places I’ve tried so far and there’s no judgement on food trucks! We’ll have to BT’s too! Too nice. I do love me some smoky chicken! !